For other uses, see Jolt. Jolt is the name of five fictional characters in the Transformers series. The original Jolt was a Decepticon hot rod with a sword who was introduced in 1994. Portrayed in a variety of forms, the most recent version of Jolt is a heroic Autobot who appeared in the 2009 film Transformers: Revenge of the Fallen. "Live fast, ride hard, and leave a great looking chassis!" The original Transformer Jolt was a Decepticon who turned into a hot rod. He was a member of the sword-wielding Laser Rods team. He was also released under the name Hotrod in the UK, but is unrelated to the Autobot of that name. Jolt appeared among the various characters on Transtech Cybertron in the "Transcendent Part 4" by Fun Publications. Jolt was among the characters to appear in the 2010 Transformers: Timelines comic "Generation 2 Redux", where he was one of the Decepticons under the command of Clench. Jolt appeared in the Marvel Generation 2 comics. Ransack first appeared in issue #6 as one of the lifeless Decepticon bodies. In issue #7 Rotor Force (Leadfoot, Manta Ray, Powerdive and Ransack) and the Laser Rods (Electro, Jolt, Sizzle and Volt) were sent to steal Rheanimum, a potent substance Megatron intended to use in his quest for power, from the planet Tykos. A new mold that came with a sword accessory. "There's no "I" in team." Another version of Jolt is a Mini-Con who turns into a helicopter and partner to the Autobot Hot Shot. Jolt appeared as the sidekick of the Autobot Hot Shot in the animated series Transformers: Armada, where he spoke only in electronic beeps. Jolt appeared in the Dreamwave Productions comic book series for Transformers: Armada where he was given a much fuller character than in the animated series. Jolt appeared among the Mini-Cons in issue #18 of the Transformers: Armada comic book who aided Over-Run using the Mini-Con Matrix in the defeat of Unicron. Jolt is among the characters appearing in the 2004 Transformers video game for the Playstation 2. Jolt was initially released in red with Hot Shot in 2002. The original Armada Jolt was released in yellow in 2003 with Powerlinx Hot Shot. A building block set with Hot Shot and Jolt. There were plans to release a repaint of Armada Hot Shot called Smokescreen with Mini-Con Jolt, a homage to Generation One Smokescreen in the Universe line, but although prototypes were seen, the toy was never released. When a new Universe line consisting of original molds (based on classic characters) was developed, Hot Shot and Jolt were included. Instead of simply releasing their original tooling (as had been done with Armada's Unicron), a new tooling was made for both the Autobot and his Mini-Con partner. Both look very similar to their original Armada incarnations. As with the original, Universe 2.0 Jolt is bright red in color. Very few were released before the cessation of the Universe to make way for Revenge of the Fallen toys. Jolt (Hop in Japan) is the leader of the Recon Mini-Con Team. He has a child-like sense of wonder and curiosity - possibly a bad thing when he is with his human friends. He refers to Bud as "Master Bud" in a manner reminiscent of a butler, until Bud has him amend (so he changes it to the less formal, if awkward, "Bud-dude.") He is very loyal to his team and friends, and of all the Autobots in this series, he is the closest to the human characters. In Japan, the Galaxy Force series is an original continuity, distinct from Micron Legend (Armada) and Super Link (Energon), so it is very unlikely that he was originally intended to be the same character as Armada Jolt. A transparent blue redeco of Jolt. Packaged with Shadow Reverb and Sixspeed. Jolt is one of the lowest ranking Decepticons ever made, with a rank of 2 out of 10. Oddly a robot called Dead End appeared in the IDW comics Transformers: Alliance who resembled Jolt in vehicle mode, but his origin completely contradicts the biography on the toy. His robot mode is never seen. The toy of Jolt is 13 cm long in vehicle mode, whereas a real Bugatti Veyron is 447 cm long, so the toy is at a scale of about 1:34. The toy stands about 14 cm tall, which means Jolt would stand about 481 cm or 15 feet 10 inches tall. According to Hasbro officials at Botcon 2008 the Walmart exclusive redeco toys were originally to be sold under the Transformers: Universe label, but Walmart requested its exclusives be part of the movie toy line, so they were repackaged in movie style packaging. Jolt is armed with a pair of electric whips, befitting his electric car alternate mode. He was a last-minute addition to the cast as General Motors, the film's car supplier, wanted to promote the Volt. The writers had already wanted to include the car in the script before the Writers Guild strike, so they had to work out a character that would fit well within the Autobot team afterwards and convince Bay to approve the addition. Jolt is seen driving in vehicle mode on a highway with Ratchet and Optimus Prime. He is also seen mourning over Prime after the battle in the forest. He is in the final battle, fighting alongside his fellow Autobots to fend off the incoming Decepticons, and helps Ratchet connect Jetfire's remains with Optimus. He uses his "electro whips" to surge power from Jetfire to Prime so they can combine in the final battle. In film Transformers: The Last Knight, appears Jolt's head can be seen in the junkyard alongside that of a Decepticon protoform. This relates to the fact that Jolt had died in the Dark of the Moon prequel comic series Rising Storm. His grave later appeared in the first issue of the Dark of the Moon comic adaptation. Jolt appears in Transformers: Nefarious #1, set months after the events of the 2009 film. Bumblebee, Breakaway, Jolt, Knock Out and Dune Runner are sent to investigate spark fragments detected at Kingdom Petrochemicals. Arriving first Breakaway is warned by Soundwave to leave, but unwilling to give in the Autobot is swiftly defeated. Bumblebee and his team fire on Soundwave, who escapes. Pictures of this toy leaked onto the internet in December of 2008. 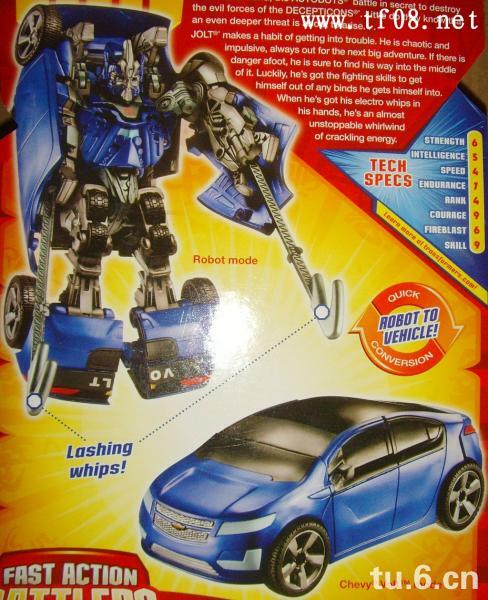 Deluxe class Jolt transforms into a blue Chevrolet Volt with translucent blue plastic windows. His car mode is very conspicuously split where his arms and legs separate during transformation. In robot mode, he has light blue "electro whips" in each arm which are deployed by turning a small knob on his wrist. His head features blue light-piping for his eyes, but there is a gray protrusion behind his head which completely prevents light passage. This protrusion also prevents his ball-jointed head from turning other than in the slightest of angles. Turning his waist activates his MechAlive feature, which consists of moving gears inside his translucent upper chest. A gift set featuring a yellow camouflage redeco of Deluxe Brawl and a silver redeco of Legends Jolt. A redeco of Deluxe Jolt with electric bolt decals on the side panels. Come with a Mechtech weapon. ↑ Alvarez, J.E. (2001). The Unofficial Guide to Transformers 1980s Through 1990s Revised & Expanded 2nd Edition. Schiffer Publishing Ltd.. p. 105. ISBN 0764313649. ↑ Furman, Simon (2004). Transformers The Ultimate Guide. DK Publications. p. 123. ISBN 978-0-7566-3012-6. ↑ "Atari Begins the Ultimate Conflict with Worldwide Release of 'TRANSFORMERS' Video Game". Business Wire. May 12, 2004. http://www.highbeam.com/doc/1G1-116487088.html. "partners including SPARKPLUG, JOLT and LONGARM will assist"
↑ "AUTOBOTS with Bow Ties Make Middle Eastern Silver Screen Debut". Al Bawaba. June 23, 2009. http://www.theautochannel.com/news/2009/06/24/466975.html. "JOLT, an AUTOBOT based on Chevrolet’s upcoming Volt extended-range electric vehicle." ↑ "Automakers offer unique things to do". The Herald News - Joliet. February 22, 2009. http://www.highbeam.com/doc/1N1-126DDB99B13C7630.html. ↑ "VIDEO from Medialink and General Motors: Giant Movie Robots Unveiled at Chicago Auto Show.". PR Newswire. February 12, 2009. http://www.highbeam.com/doc/1G1-193478111.html. "Jolt, an Autobot based on the 2011 electric Volt"
↑ 04:40 PM. "Picture of Jolt's FAB toy bio". Tfw2005.com. http://www.tfw2005.com/boards/attachments/transformers-movie-discussion/27083783d1240975340-concerning-jolt-jolt_page.jpg. Retrieved 2009-05-13. ↑ Roberto Orci (2009-01-19). "Welcome Mr. Roberto Orci, you may ask him questions". TFW2005. http://www.tfw2005.com/boards/transformers-movie-discussion/180451-welcome-mr-roberto-orci-you-may-ask-him-questions-190.html#post3231606. Retrieved 2009-01-19. ↑ "Real Transformers on stage at the Chicago Auto Show". The Herald News. February 22, 2009. ↑ "Special stuff". The Beacon News - Aurora. February 22, 2009. http://www.highbeam.com/doc/1N1-126DDB70F389C960.html. This page was last modified on 15 May 2018, at 12:14.